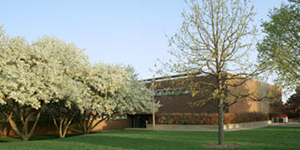 Turner Hall is home to the College of Applied Science and Technology, the Department of Family and Consumer Sciences, the Department of Technology, and a Child Care Center for students with two to ten year old children. Turner Hall opened in 1963 and was named after Jonathan Baldwin Turner. He lead the way for programs in agriculture and industrial technology at Illinois State. Turner served as President of the Illinois Teachers Institute. He was also known for his progressive ideas on education.